What's Happening? — How Do Pakistanis Think? Some readers may remember the 1961 film “The Day the Earth Caught Fire”. It could be viewed as the original “climate alarmist” film as it contains all of the plot elements of our current climate alarmism scenarios: exaggerated images of a dying planet, a mainstream media newspaper reporter, technology that is feared, the Met Office, and last but not least, junk science. You can read about the whole wacky plot here. “Global warming of 7C ‘could kill billions this century‘. Global temperatures could rise by more than 7C this century killing billions of people and leaving the world on the brink of total collapse, according to new research“A similar 2003 study had predicted a mere- but still significant- 4 degree increase in global temperatures by 2100, but those models weren’t nearly as comprehensive, and they didn’t take into consideration economic factors. So what has changed since 2003 to cause the scientists at MIT’s “Centre for Global Climate Change” to believe the world is going to boil over this century and send billions of us directly to a toasty demise similar to our featured movie? 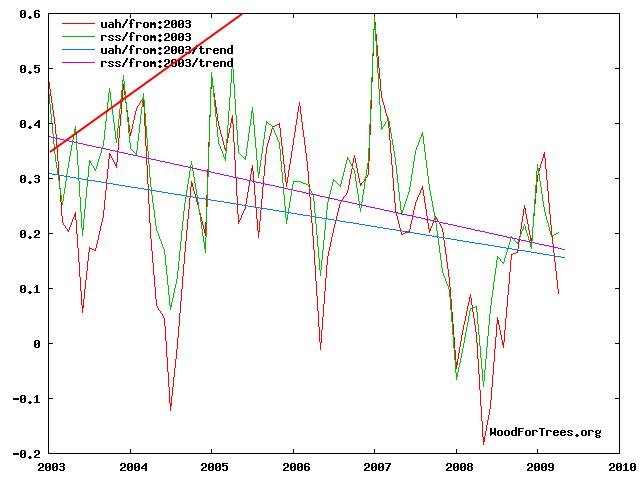 Since 2003, global temperatures have been dropping. Arctic ice extent is at the highest late May levels in the AMSR-E satellite record. Antarctic ice has broken the record for greatest extent ever recorded. January, 2008 broke the record for the most snow covered area ever measured in the Northern Hemisphere. I added a red line below showing the reported projected rise in temperatures from the MIT models, compared with the actual observed temperature trends since the previous 2003 report. Their projections show a correlation of essentially zero. Given that the observed trends are exactly opposite what the MIT models have predicted, one might have to ask what they have observed since 2003 to more than double their warming estimates, and where their 90% confidence value comes from? The study, carried out in unprecedented detail, projected that without “rapid and massive action” temperatures worldwide will increase by as much as 7.4C (13.3F) by 2100, from levels seen in 2000. This study has a strong scent of GIGO (garbage, in garbage out.) MIT has one of the world’s preeminent climatologists Dr. Richard Lindzen in their Department of Earth, Atmospheric and Planetary Sciences. I wonder if the scientists at the “Centre for Global Climate Change” checked with him before firing this remarkable piece off to the press? During the Phanerozoic, CO2 levels have at times been more than 1,500% higher than present, but temperatures have never been more than 10C higher than present. So how does a projected 30% increase in CO2 produce a 7C temperature rise in their models? During the late Ordovician, there was an ice age with CO2 levels about 1000% of current levels. Hopefully the newspaper headlines don’t accurately represent the content of the article. Finally, does their name (”Centre for Global Climate Change“) hint at a possible inherent bias in their raison d’être? What “rapid and massive action” do they want us to engage in? The United States should not have used the atomic bomb to stop the Japanese militaristic threat during World War II, seeing that it was unnecessary to cause untold suffering unto hundreds of thousands of people in Hiroshima and Nagasaki. Seeing that the United States is nowadays a champion of nuclear warming, it would be ironical if the nation would continue to agree with the logic of using an atomic bomb to end war. Certainly, the atomic bombs used during World War II – Little Boy (especially named for Hiroshima), and Fat Boy (detonated in Nagasaki three days after the Hiroshima bombing) – were deadly, to say the least. The bombs used by the United States served to terrify the Japanese people, and therefore ended the war quicker than previously believed. However, today the United States knows that the cost that was paid by the Japanese people at the expense of a war, was humungous. It should not have happened. What if it happens in our homeland? The photographs that have arrived from Hiroshima and Nagasaki are enough to convince us that the bombing was actually unnecessary (See Appendix). If Mr. Truman were to be asked his opinion today, he might agree, although he might add that it was necessary to check the potency of those bombs for the world to stop using them altogether. destruction prophesied in the Euphrates Valley Era, after Noah and his fabulous Ark. for 40 miles and more. on the old capital or the new…. The experiment was not essential to conduct upon the lives of countless civilians who ended up losing their existence to Mr. Truman’s whim. The United States should simply have shown the New Mexico desert example to the Japanese, and warned them thereby. Science allows for such examples to serve as warnings. In any case, Mr. Truman was successful in that he managed to warn the Japanese alright. As a matter of fact, the Americans promised the Japanese more ruin to come from the air, if the latter failed to concede subsequent to the Hiroshima explosion. Was it not reasonable for the U.S. to have waited more than three days before it also bombed Nagasaki – for the effects of the bomb to show up in greater intensity in Hiroshima, or for the Japanese to simply look upon their damages and surrender? The effects of the bomb were present the first day to boot. Unfortunately, the Japanese did not concede until after the Nagasaki bombing. According to the Americans, by bombing Hiroshima and Nagasaki, they terrified the Japanese into surrender. However, it can reasonably be argued that the United States should have used its actual scientific testing of the nuclear weapon (in the Mexican desert) to scare the Japanese, instead. The U.S. could have easily reported the scientific testing in the Japanese press. Furthermore, the U.S. should not have bombed Nagasaki after Hiroshima, seeing that the effects of the bomb in Hiroshima were horrible at best. The United States is a nation of people standing by God through their world-famous Declaration of Independence and Constitution. It is quite obvious from news reports about the Hiroshima bombing alone that the attack called for the help of God. In actual fact, the attack was a miserable failure for the United States because it stopped all sense of normal life in Hiroshima in the twinkling of an eye. Quite similar to 9/11, the Hiroshima bombing was enough as warning, even if we were to give the U.S. the benefit of the doubt by assuming that the scientific experiment could not have been enough of a warning for the Japanese. The U.S. should not have gone forward with the Nagasaki bombing after inflicting a disaster similar to 9/11, but bigger in magnitude than 9/11. It was an inhumane mistake. Fortunately, however, the United States is now wise enough to avoid such disasters in the present and the future. The world knows that the nation is capable of inflicting such a disaster, and other countries are developing similar military power in a race to rule the world. All the same, everybody now understands that it is atrocious to use atomic bombs on other human beings like unto ourselves. It is not only inhumane, but also stupid to use nuclear weapons when scientific experiments (including Hiroshima) have clearly shown the immensity of the damage that these weapons may inflict. It is, moreover, a terrible mistake to be thinking of developing such weapons. Even though they serve as good warning measures, or may be later used in an ice age; atomic bombs are atrocious to employ on people. Lastly, it is essential to realize that it is never necessary to be violent and horrible. Rather, the concepts of peace, love, and brotherhood – all emotional appeals – plus numberless varieties of logical appeals could keep us on the paths of peace and prosperity. In fact, the relationship between U.S. and Japan as it exists today is evidence that the realization has hopefully occurred. See “Atomic Bombings of Hiroshima and Nagasaki,” Wikipedia (2007), 6 June 2007, Retrieved from http://en.wikipedia.org/wiki/Atomic_bombings_of_Hiroshima_and_Nagasaki; and “Harry S. Truman, Diary, July 25, 1945,” Atomic Bomb Decision, 6 June 2007, Retrieved from http://www.dannen.com/decision/hst-jl25.html. “Harry S. Truman, Diary, July 25, 1945,” Atomic Bomb Decision. “1945: US drops atomic bomb on Hiroshima,” BBC (6 August 1945), 6 June 2007, Retrieved from http://news.bbc.co.uk/onthisday/hi/dates/stories/august/6/newsid_3602000/3602189.stm. “Atomic Bombings of Hiroshima and Nagasaki,” Wikipedia. In the Name of Allah, the Most Compassionate, the Most Merciful!